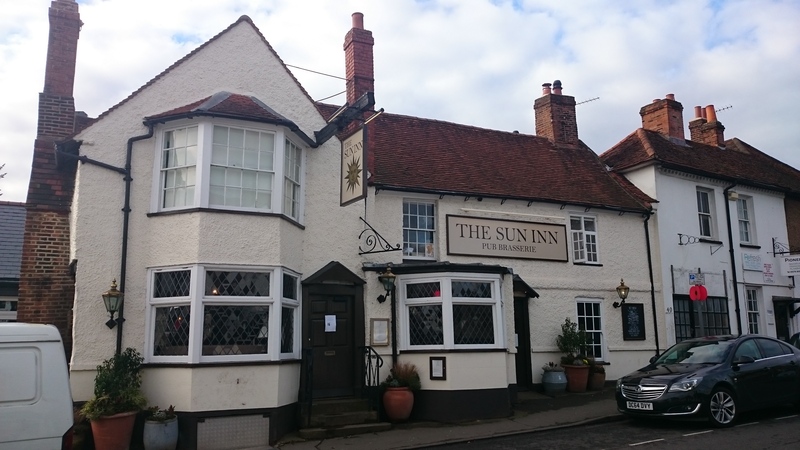 Anne and I met for lunch at The Sun pub on Chobham High Street. It may not look much from the outside, but inside is hugely charming and inviting. 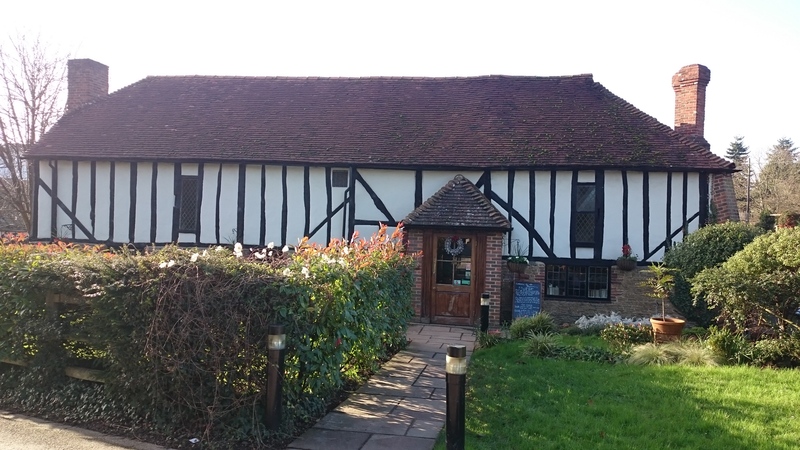 The pub is part of The White Brasserie group, group of Surrey pubs that combines traditional Britishness with French food. The feel is very fresh without being soulless. 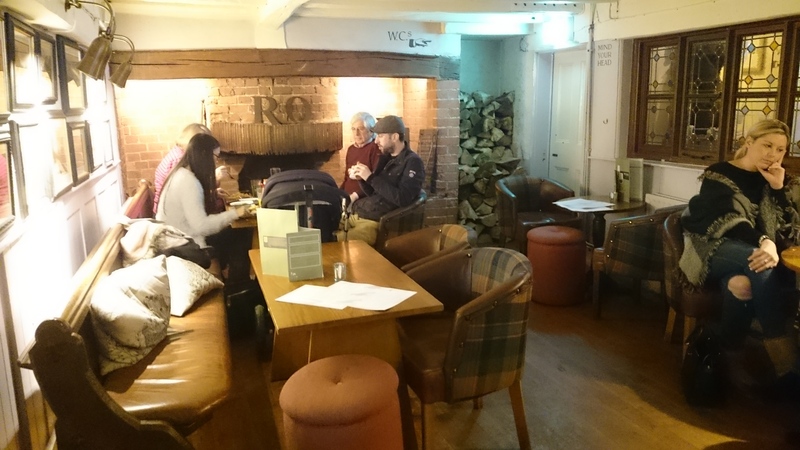 The original section of the pub is charming, complete with wood fires and cosy corners. 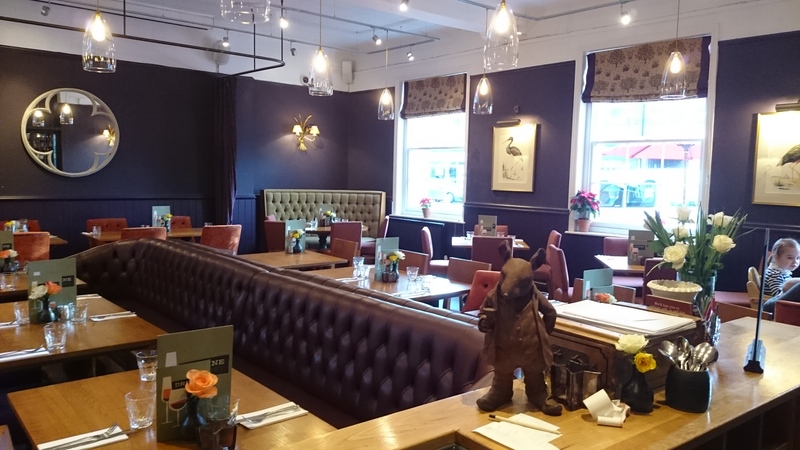 When the White Brasserie Company took over the pub in 2014, they sympathetically built a large extension to the side that now serves as the restaurant area. It’s a beautiful double aspect space with a huge amount of light. High ceilings and exposed beams give it character, even though it’s new. It was very busy during our visit, but was quiet enough to easily carry on a conversation. Service is friendly and attentive. The atmosphere relaxed but sophisticated. A la carte menus change seasonally. Set menus change monthly. We both dined from the lunch menu, two courses £9.95. 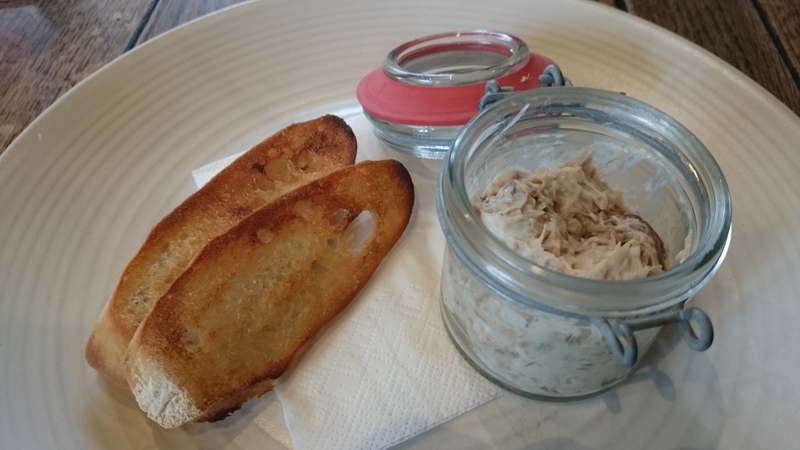 I started with the Potted smoked mackerel, horseradish cream, toasted baguette. It was yummy, though I might have done with a bit more toast. Anne went straight to mains withe the Steak frites ‘Express’ (£2 supplement.) She really enjoyed the meal. 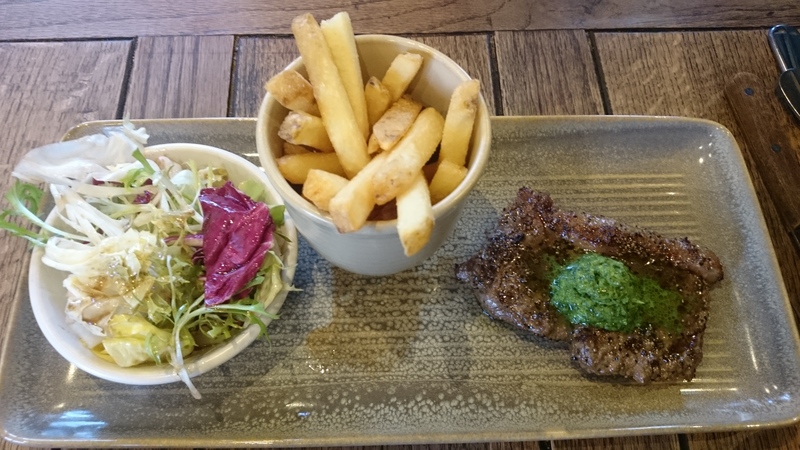 The steak was delicious, the salad well dressed and the chips crispy with fluffy centres. While I wanted all of the appetisers, I struggled a bit with mains. Not because they didn’t sound delicious but because they sounded heavy for lunch. 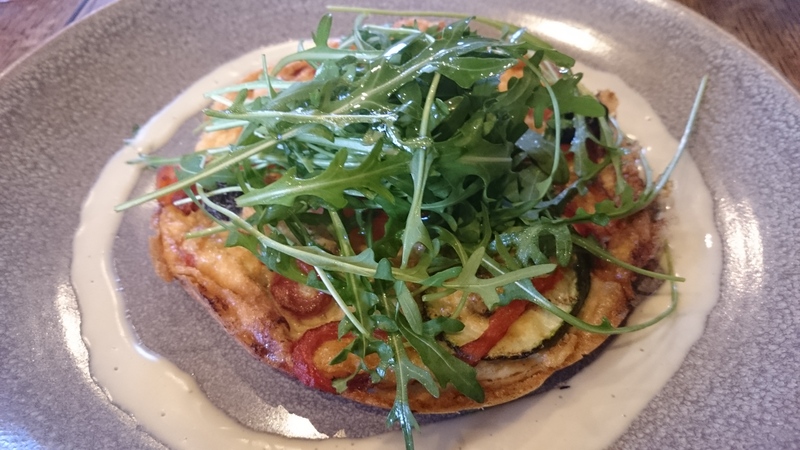 I settled on the Spanish omelette, roasted red peppers, potatoes, onions, olives & courgettes, roquette salad. I really enjoyed it, the delicious vegetables were generous and took centre stage over the eggs. Mind also came with a pot of chips, which was far more food than I could manage. 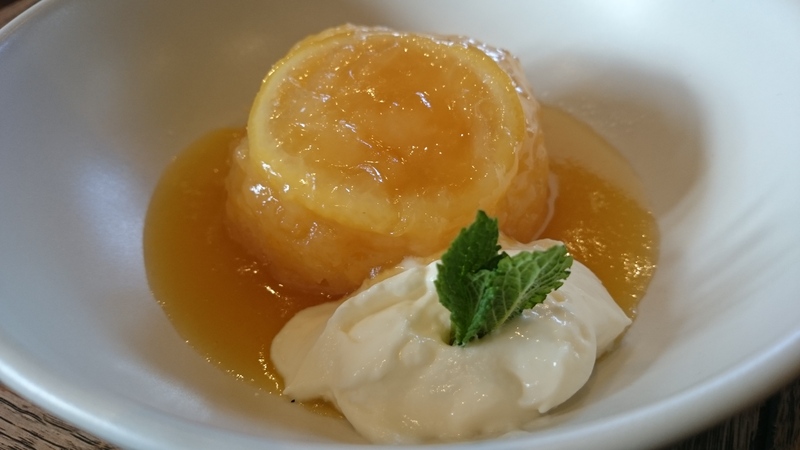 Finally, Anne and her sweet tooth had dessert, the Steamed lemon sponge pudding, lemon curd sauce. It was chock full of lemon flavour cut through with the cream. Levels of great textures made for a tasty treat. 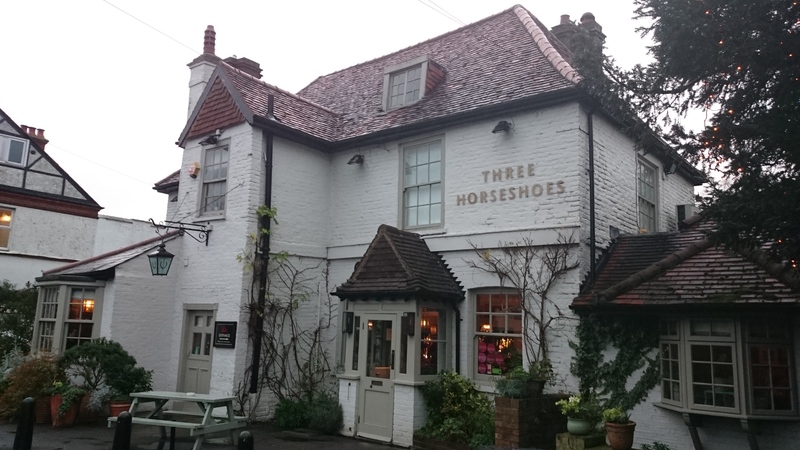 The White Brasserie has seven other pubs in Surrey (all of their pubs are in Surrey), including The Queen’s Head in Weybridge. 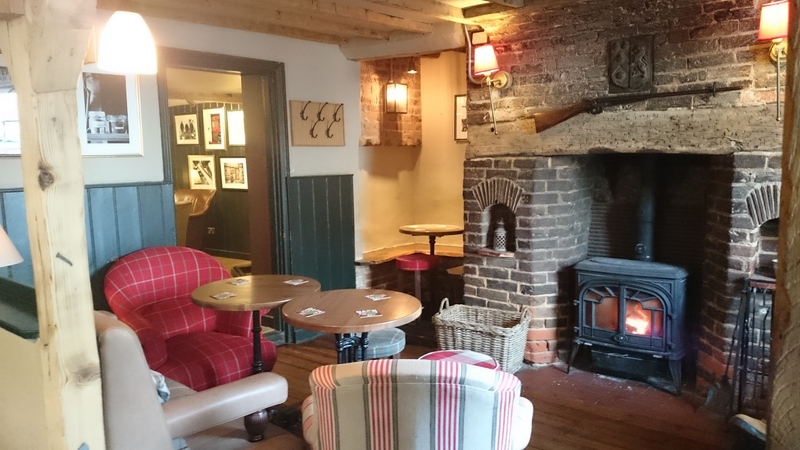 The Cricketers Downside, near Cobham is currently undergoing a million pound renovation and due to open in March 2016. The Sun is definitely a good choice for a meal in Chobham. It’s definitely worth venturing into the village for. 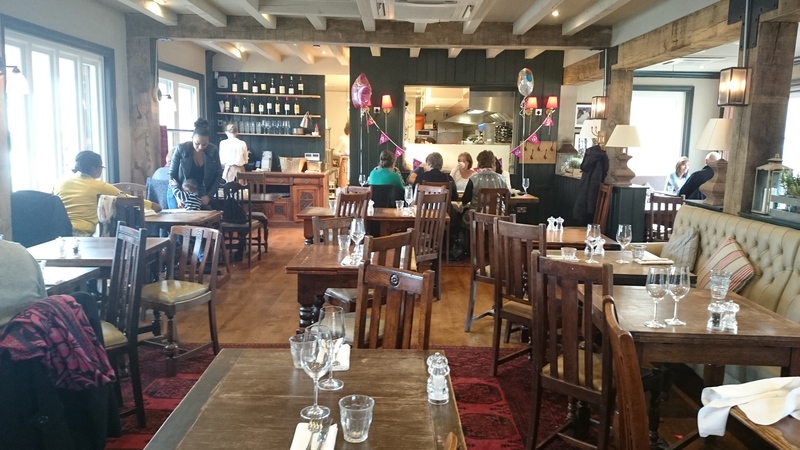 The White Brasserie group has a reliable selection of Surrey pubs that offer both great food in charming old pubs. 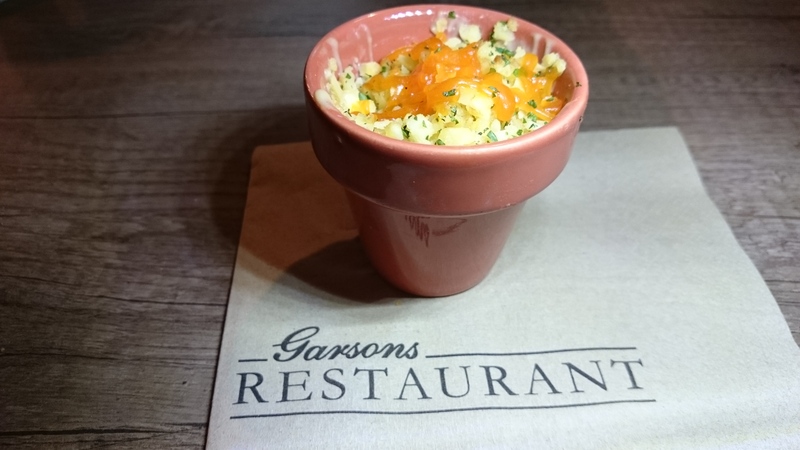 After attending the official launch of Garson’s Restaurant, I was so impressed and intrigued that I hurried back to see how it was on a regular business day. In summer, the glass walls will fold back, blending the strawberry picking fields with the restaurant. We visited on Sunday, probably arriving about one thirty. The restaurant was very nearly full. There was a nice background buzz but it wasn’t noisy, we could easily have a conversation and hear ourselves without having to strain, possibly because of the slant of the ceiling. 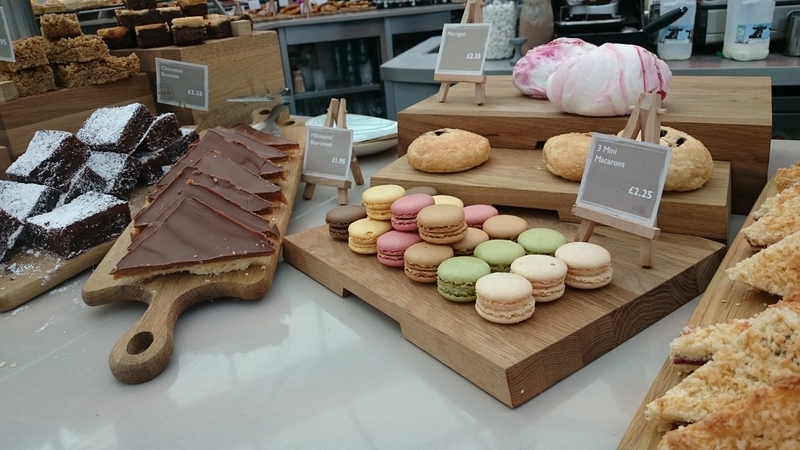 There are tons of goodies to tempt you, for dessert or if you’re only coming for coffee. All staff members we dealt with were cheery and friendly. A staff member was greeting guests at the door, to help people navigate the new restaurant. Tables seemed to be promptly cleared. We were shock when our food arrived shortly after we’d ordered it. I’d barely sat down from nosing around when it came. 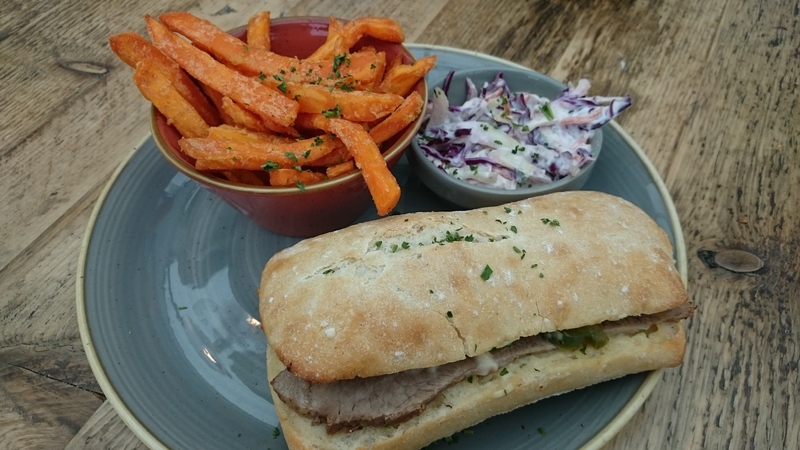 For lunch, Jman had the Hot steak & cheese ciabatta erved with sweet potato fries & house slaw £8.95. He loved it, the beef was really tender, good slaw and nice sweet potato fries. 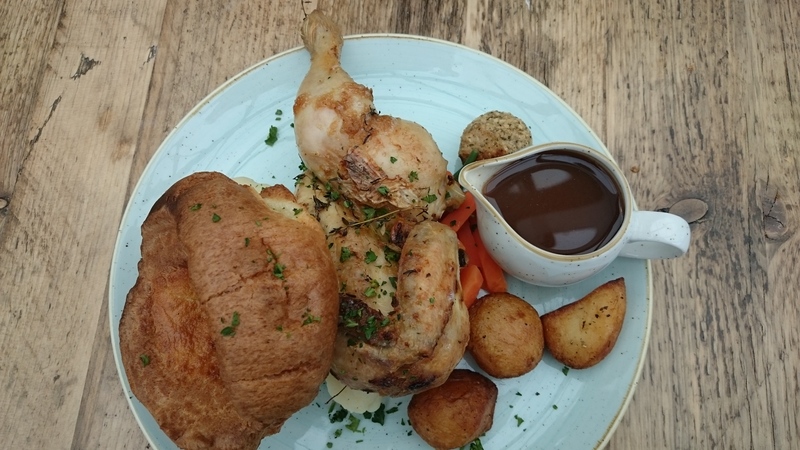 Being Sunday, I went for the Roast chicken & stuffing served with roast potatoes, carrots, green beans, Yorkshire pudding and gravy £9.95. Wow, I was really surprised at the quality of the food. Fresh thyme and even half a bulb of garlic was on my plate along with with food, and the flavours were definitely apparent. A real man sized portion, there’s no way I could have finished it. What excellent value for money. Garson’s Restaurant definitely didn’t disappoint in the daylight. It’s a lovely spot with a great sense of light that serves up great food. I most definitely be returning. 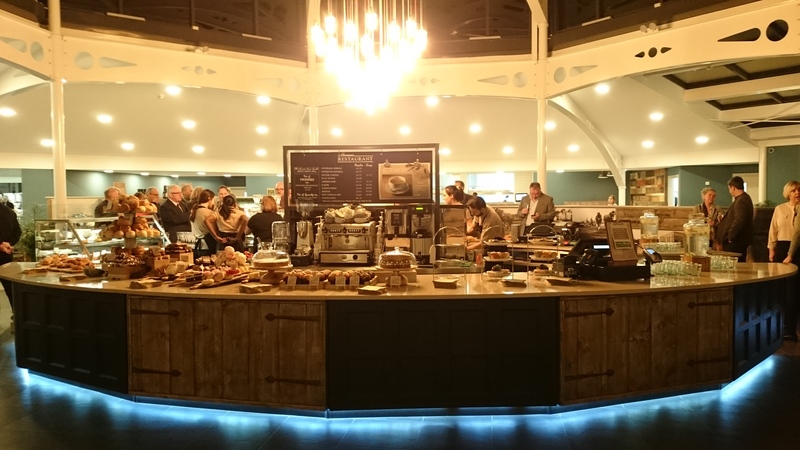 Last night I had the pleasure of attending the new restaurant at Garson’s Farm in Esher’s West End official opening. 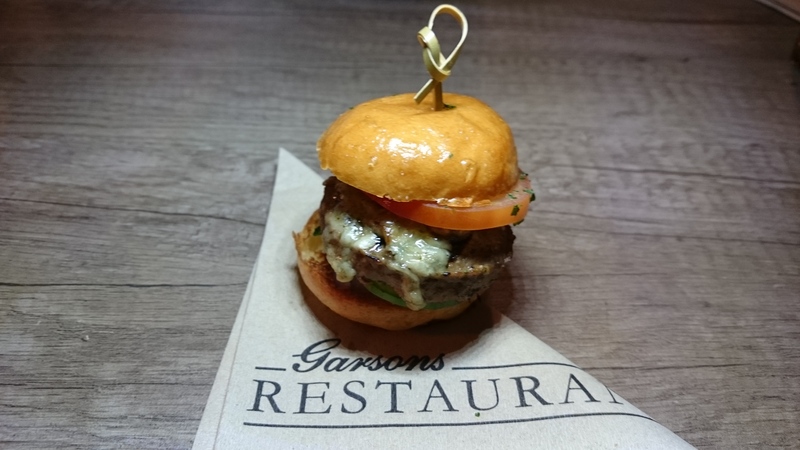 I don’t know if you’ve eaten at Garson’s in the past, but throw all those memories of boring out the window, this new restaurant is sure to become a destination lunch spot in Surrey. Housed in a brand new show stopping building, the octagonal room reminiscent of a city market, complete with art deco steel framework. Highlight is the raised octagonal lantern in the centre of the room, punctuated with a huge chandelier. Only a small section of roof over the entire room isn’t glass. 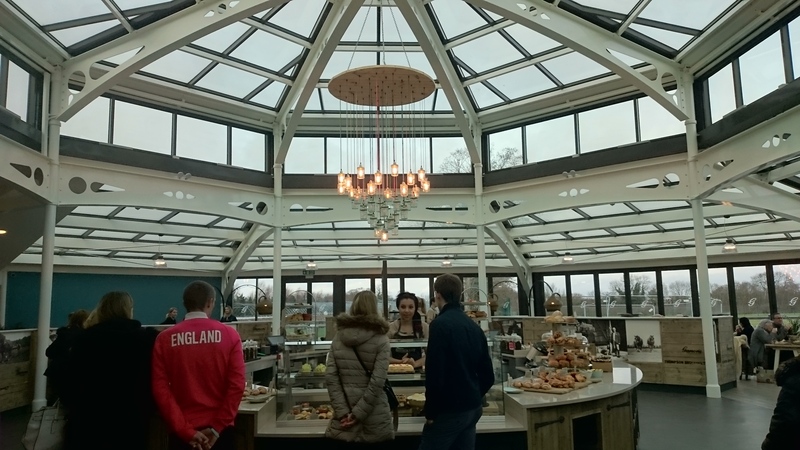 Retractable glass doors on four sides of the octagon fully open in summer, giving access to the patio and views over their fields down to the River Mole. Interestingly, they’d laid 8km of pipes underneath their fields, and that provides geothermal heat for the restaurant and heats the water used in the kitchen and restrooms. It’s a huge space. 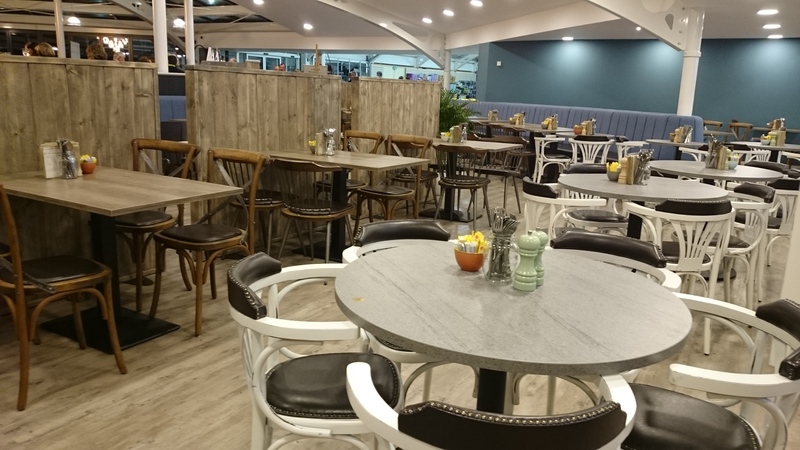 Inside, seating is a mix of comfy booths and traditional country style tables, broken up around the large space with accented seating areas of banquettes and mood lit tables. 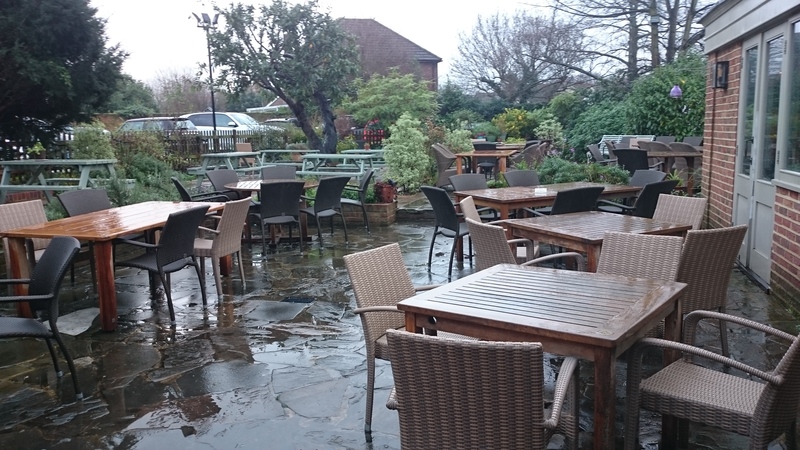 Outside is a huge patio area for al fresco dining in warmer months. 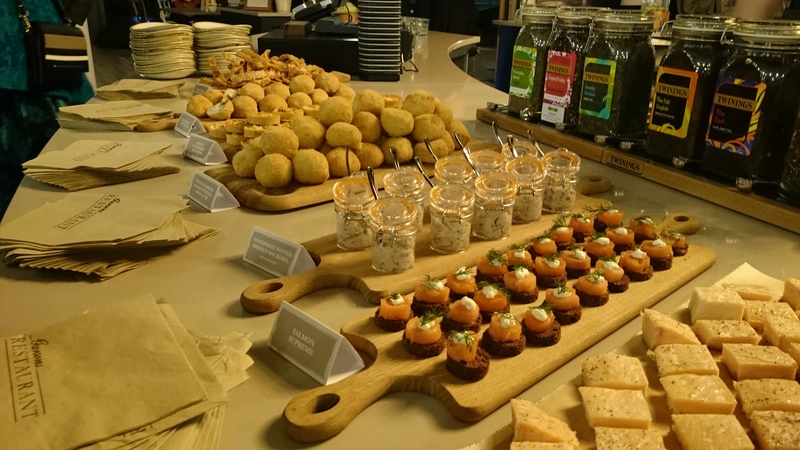 We sampled a variety of delicious canapes. The menu changes seasonally. All food is prepared fresh onsite. Often using ingredients grown onsite and picked that morning. Most baked goods baked onsite, including scones and tray bakes. Even Scotch Eggs and some breads are made onsite. What isn’t made onsite is sourced locally as much as possible (local bakeries, etc.) Meat is sourced form a local butcher. 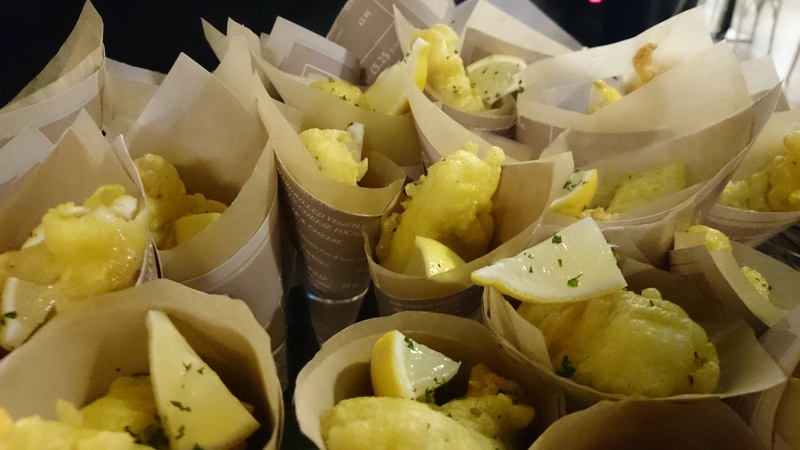 We sampled miniature versions of several dishes form the menu, (fish & chips, macaroni and cheese, burger with stilton, beef brisket and mash.) They were all tasty, my favourite was the mac and cheese, it was nice and creamy with lots of flavour. 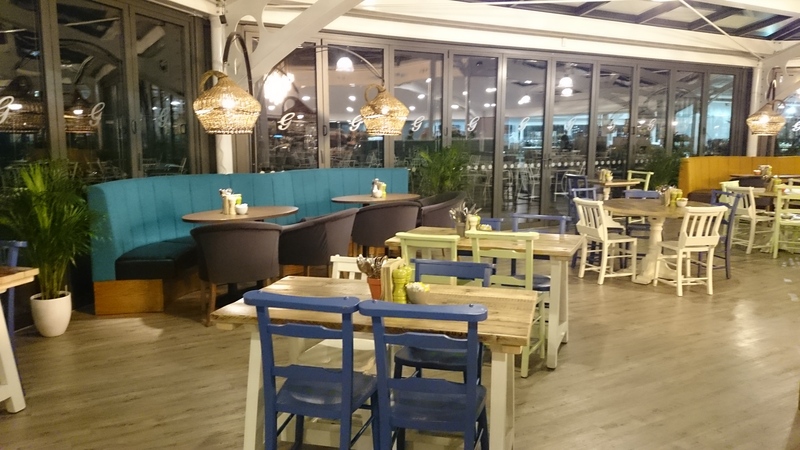 The menu offers an assortment of dishes, from salads (£6.95), sandwiches (£5.25-£7.45) and jacket potatoes (6.95-7.95) to full meals (£7.95-£9.75) and sharing platters (£11.25). Kids options are pick n mix lunch boxes (£4.55) and hot meals (£4.95). Breakfast is served until 11:30, for which there’s a good selection to choose from, from a make your own smoothie bar (£2.95 adults) to a full farmhouse breakfast (£6.95 meat or vegetarian). Order at the counter and food is brought to your table. 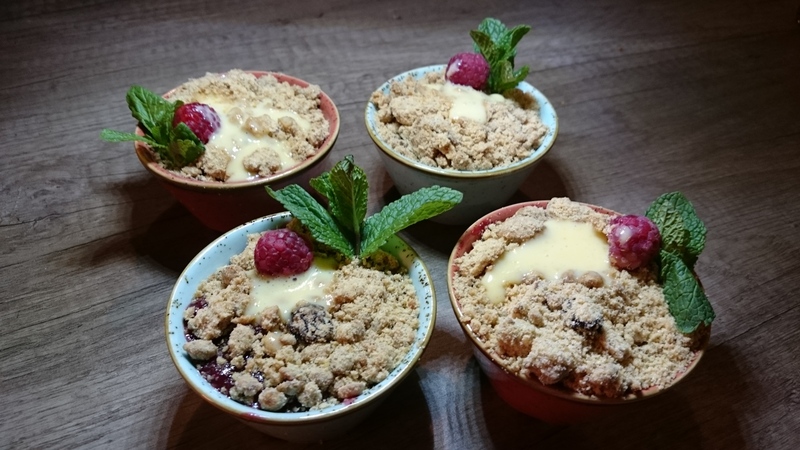 We sampled a few of the sweet treats, including a mouthwateringly delicious crumble. 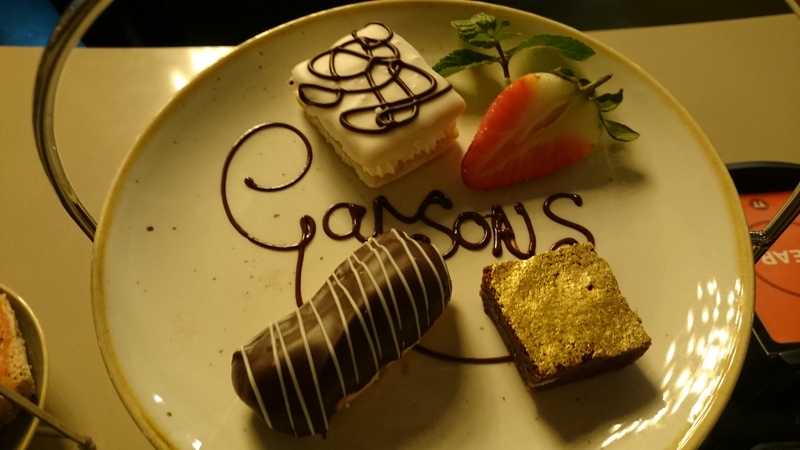 Perhaps most exciting of all (for my Canadian guests anyway) is the Garson’s afternoon tea, three tiers of goodies, £12.95 for two people, or with prosecco £17.95 for two people. 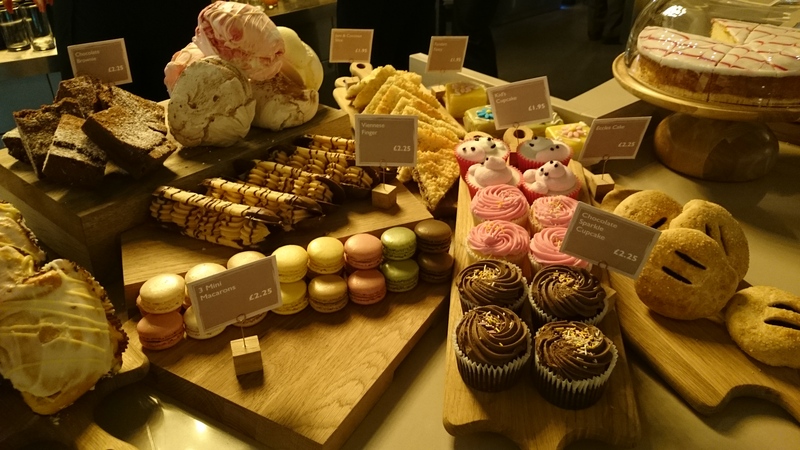 There’s also a daily selection of all sorts of treats, displayed on the counter. I’ve got to say, I’m really glad I live ten minutes away and most definitely will be visiting. 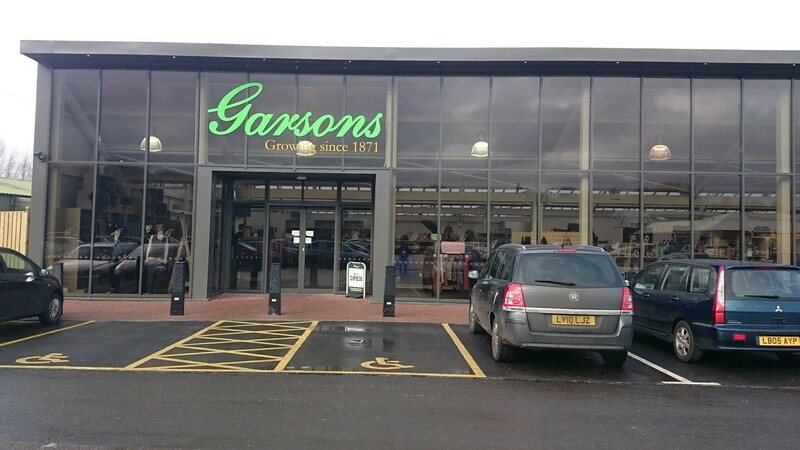 Even if you’re not so close, Garson’s is well worth an outing. I have every confidence the new Garson’s Restaurant will be a game changer for the local area. 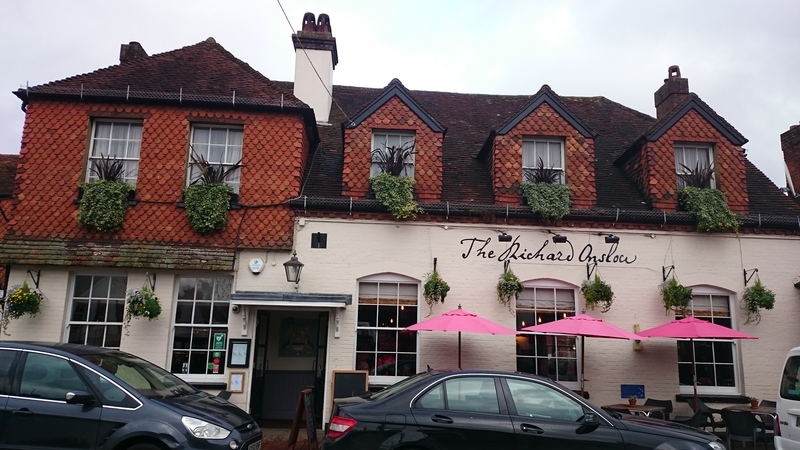 A drive through the beautiful Surrey Hills brought us to lunch at The Richard Onslow in England’s largest village, Cranleigh. 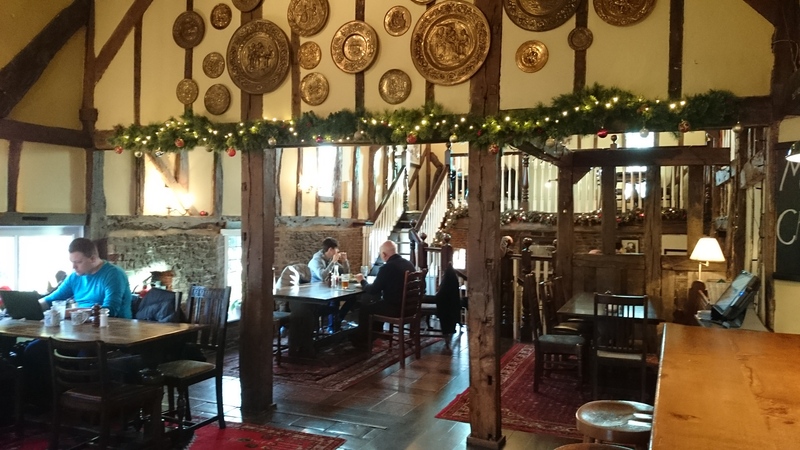 Located in a neat building, parts of which date back 500 years, on the high street, the pub started life as a coaching inn. They still have ten hotel rooms, some of which are dog friendly – perfect for a weekend of dog walks in the surrounding hills. The restaurant area is a delightful, I want to say Georgian, room complete with double aspect sash windows that let in tons of light giving the room an airy feel. I particularly love the super long double fronted banquette down the centre of the room. 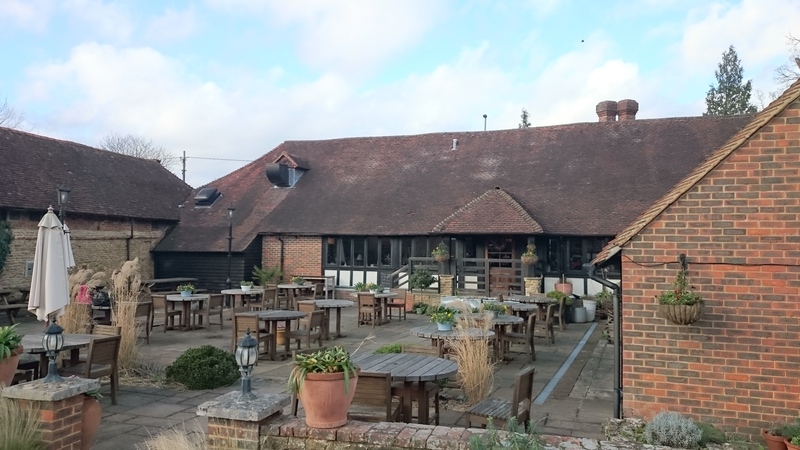 It’s a Peach Pub (their only Surrey location), a group of pubs that pride themselves on preparing all fresh food, seasonally sourced where possible from British suppliers. 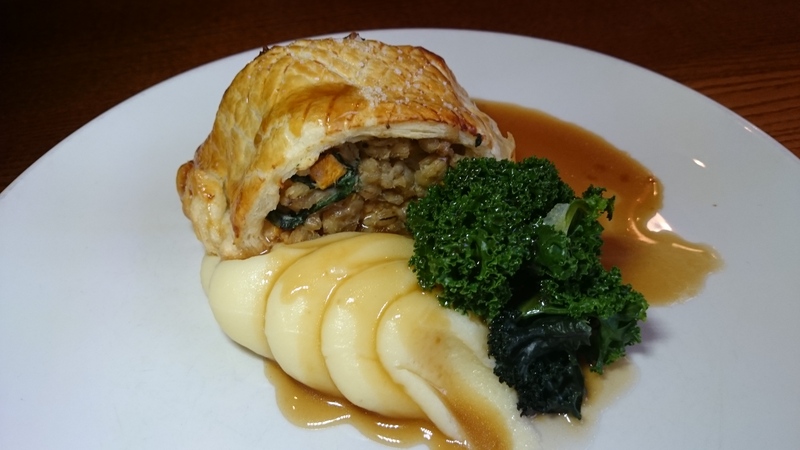 Menus change seasonally, as well as a good selection of specials. Service is super friendly and the vibe is relaxed. To the left of the entrance is a charming pub area. 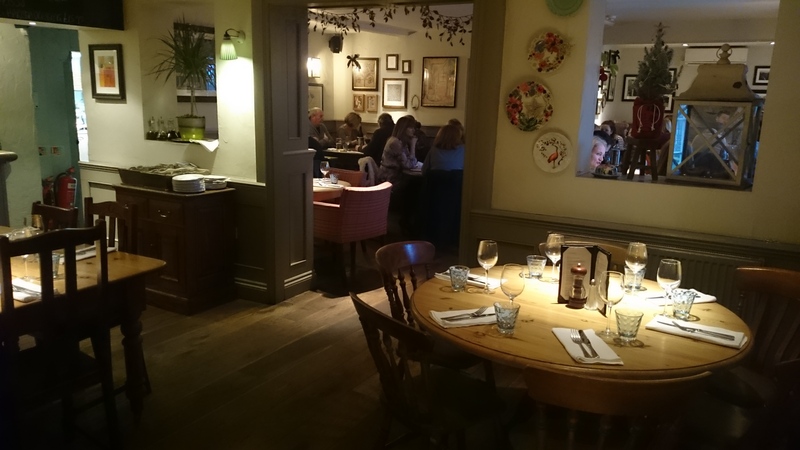 It’s a contrast the the restaurant area, has a much older feel and comes complete with a working Inglenook fireplace and flagstone floors. The entire building was completely renovated when Peach Pubs bought the property six years ago and feels current and fresh. 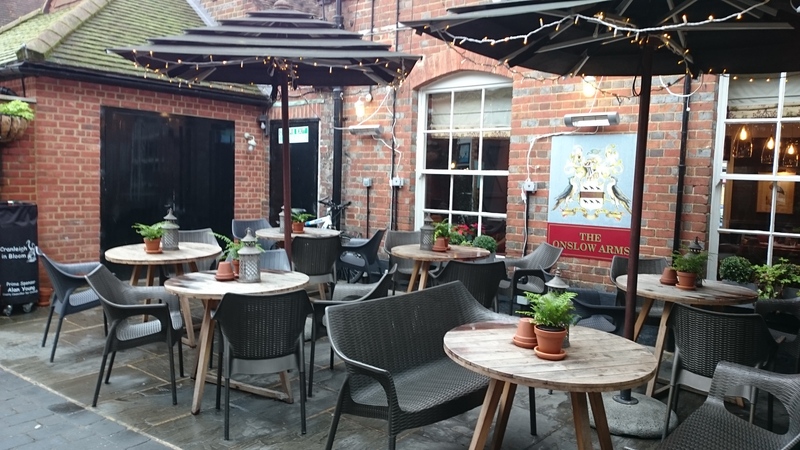 In addition to outside tables along the high street in front of the pub there’s also a dining area in the old coaching inn’s courtyard. 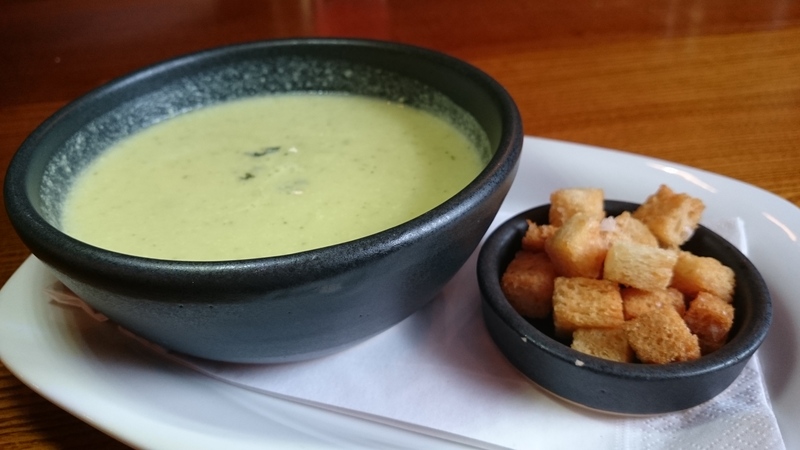 For lunch, Jman started with the Soup of the day, broccoli and stilton £5.25. He really like the croutons on the side concept, they were nice and salty and he could control how many we in the soup. 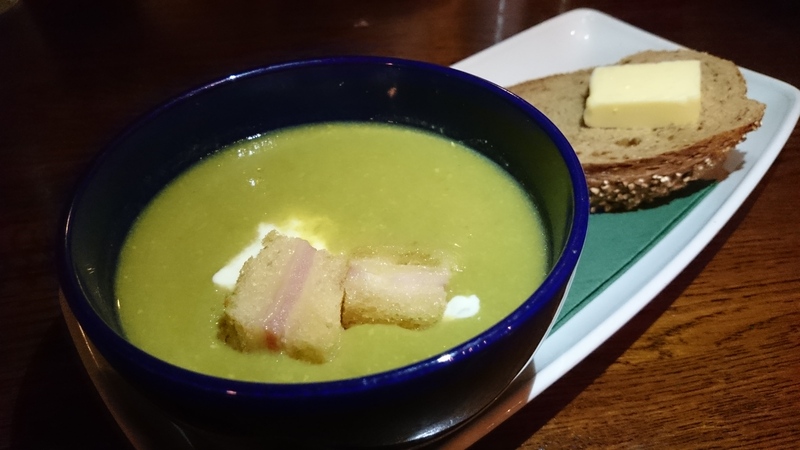 The soup itself was good and nippy from the stilton, very morish. 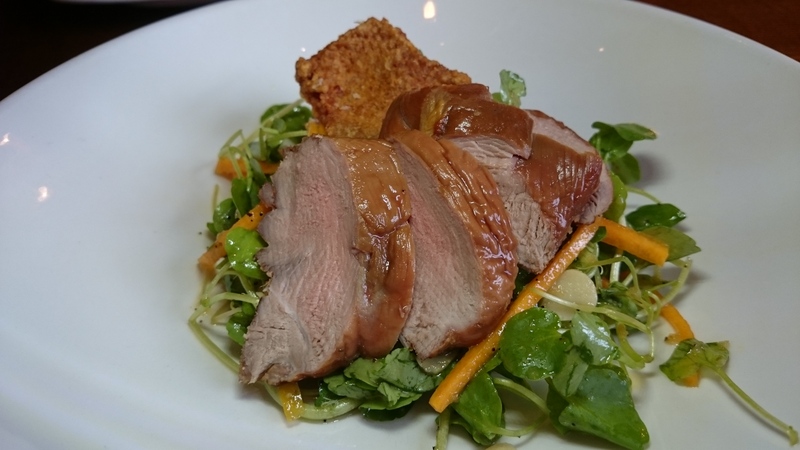 I started with the Free range smoked duck, almond, watercress & orange salad, quackling £8.75. I was surprised when it came, I thought I was getting little pieces of duck in a whole lot of lettuce, instead I got a big piece of nicely flavoured, moist duck with great orange flavours. The quackling was quacker jack. 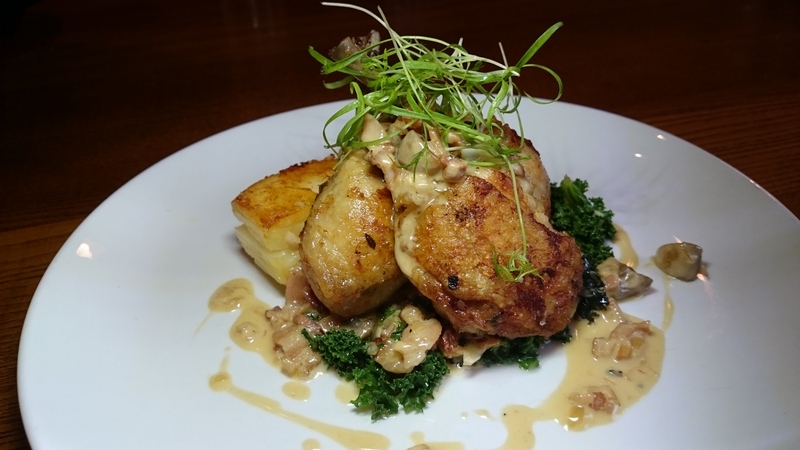 For his main, Jman chose, again from the specials board, Sauteed chicken, smoked bacon & mushroom sauce, Dauphinoise potato £13. The dish was full of flavour and the chicken nice and juicy. He was very pleased with his choice. It was a unique vegetarian dish,interesting with lots of flavours and all round yummy, though I did wish for a bit more squash. 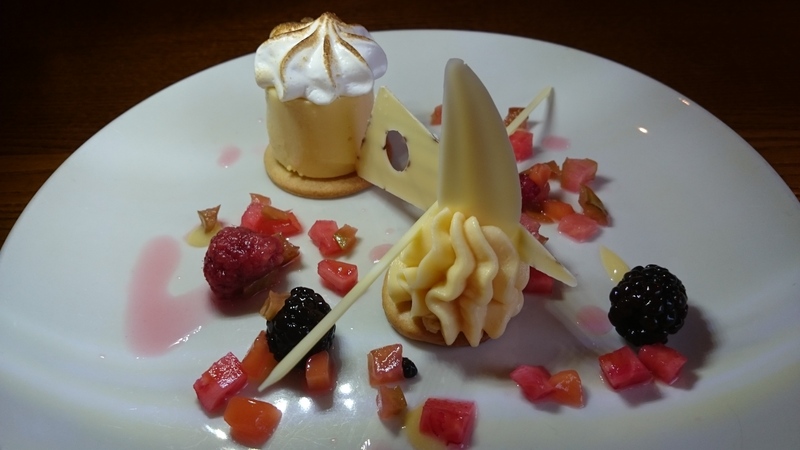 Despite the January pledge to watch our weight, we couldn’t resist sharing the Lemon tart, toasted marshmallows and a poached fruit salad £6 The other bits on the plate are white chocolate (the triangles and the ‘stick’) I felt like I’d stepped onto the set of Masterchef when the plate was set down in front of us. We immediately cursed ourselves for not ordering two desserts (or three). We were expecting standard lemon tart but got something special. If passing through Cranleigh definitely stop in if only for dessert. 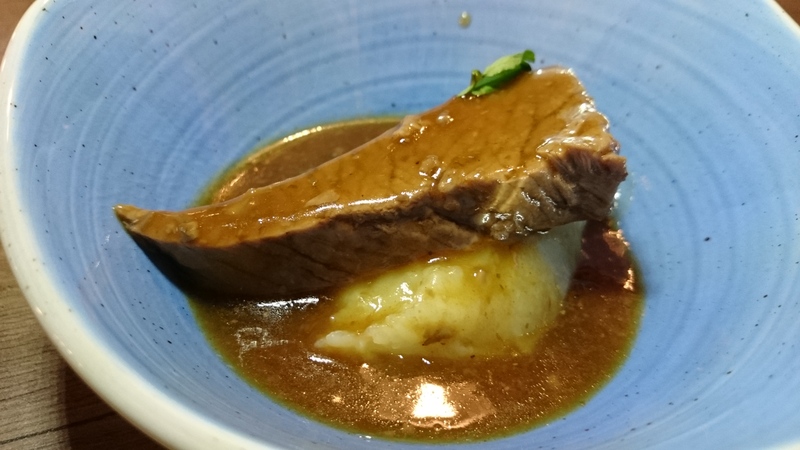 The Richard Onslow serves up an impressive quality of food in a great old building and is definitely worth a visit. My complements to the chef. We were guests of The Richard Onslow but this is no way biased my review. We arrived after 2pm and the pub was packed. 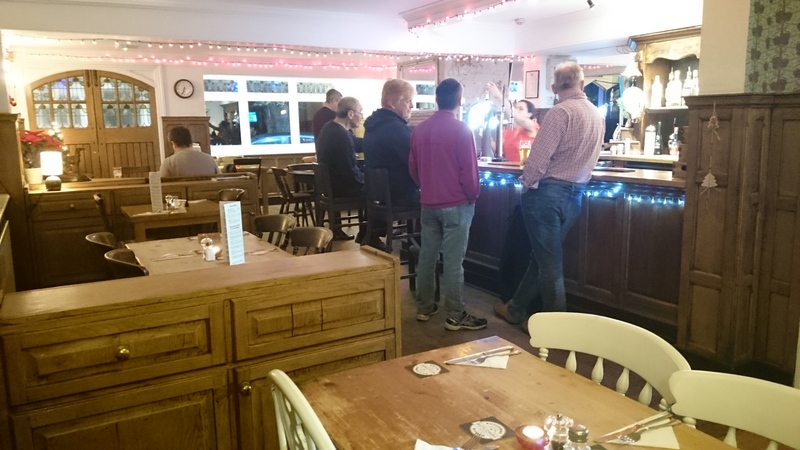 We were lucky enough to find one available table in the bar area – the restaurant was full. Granted it was the Saturday after New Year’s but still you would be wise to make a reservation. From outside it looks like a smallish house converted into a pub. Inside is a rambling series of rooms, some belonging to the bar and some to the restaurant. The rooms are stylishly decorated. The bar area we sat in was filled with fun a4 size retro posters relating to nearby Shepperton Studios. Because the rooms are small, the noise level is not too loud but as they spill into one another you still get the buzzy vibe. 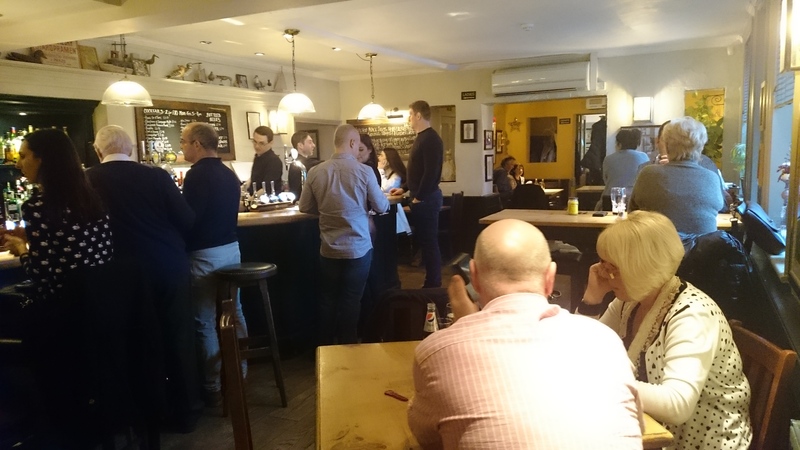 You’d be hard pressed to find a better atmosphere, even in other Pearmain Pubs. There’s a large outdoor patio. Service is friendly, helpful and knowledgable. The menu is well thought out with something for everyone. All food is prepared fresh onsite. 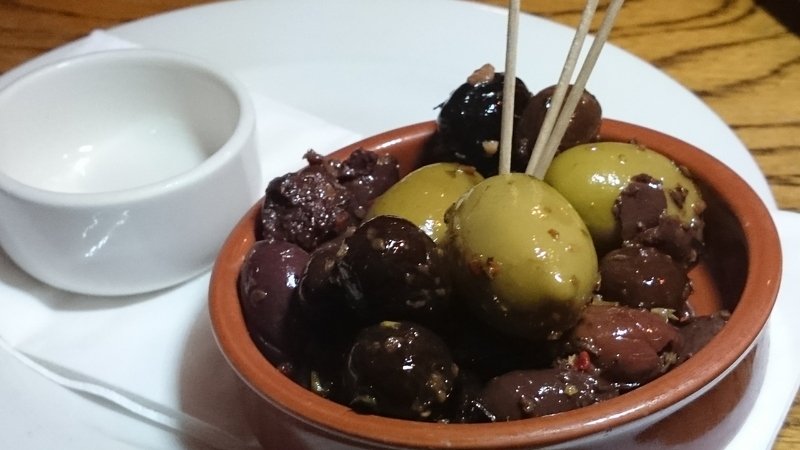 We started with Olives £2.25 from bar snacks menu. We ordered a side of Calamari £4.75 from bar snacks menu. The calamari itself was divine. 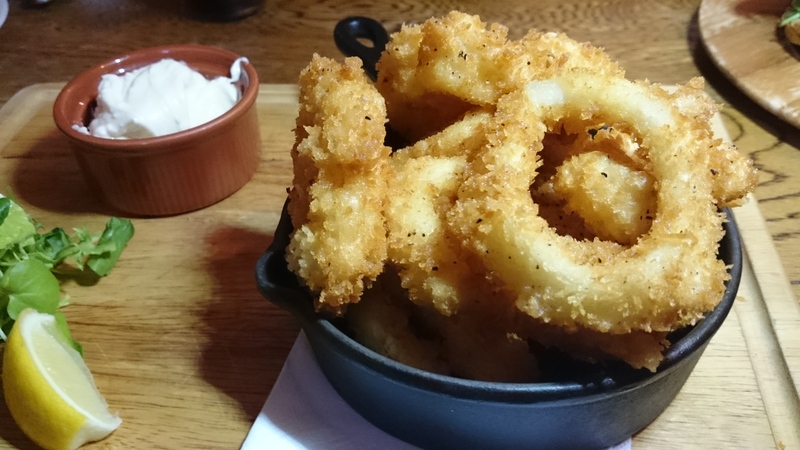 Well spiced, crispy coating on fat rings of squid. The dip was a little blah, I think it was just mayonnaise. 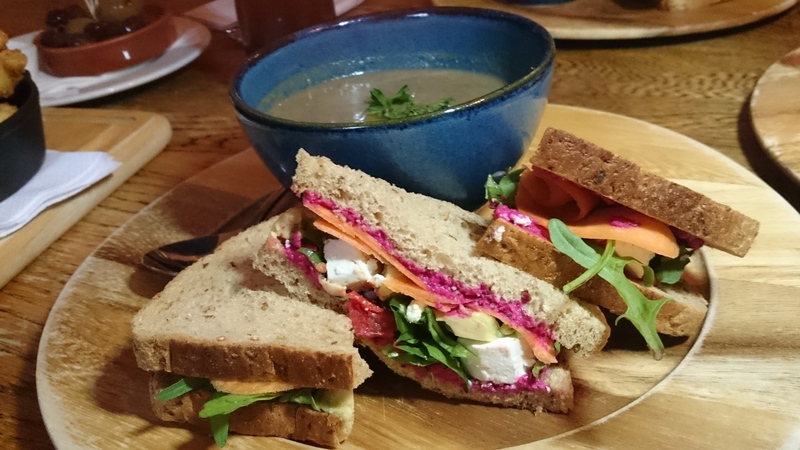 For his lunch, my father in law had the Beetroot houmous, avocado, carrot, sunblushed tomatoes & feta cheese on granary bread with wild mushroom soup £7.50. It was a lot of food for lunch, a large sandwich plus the side of soup but everything was really tasty. The wild mushroom soup of the day was particularly memorable. 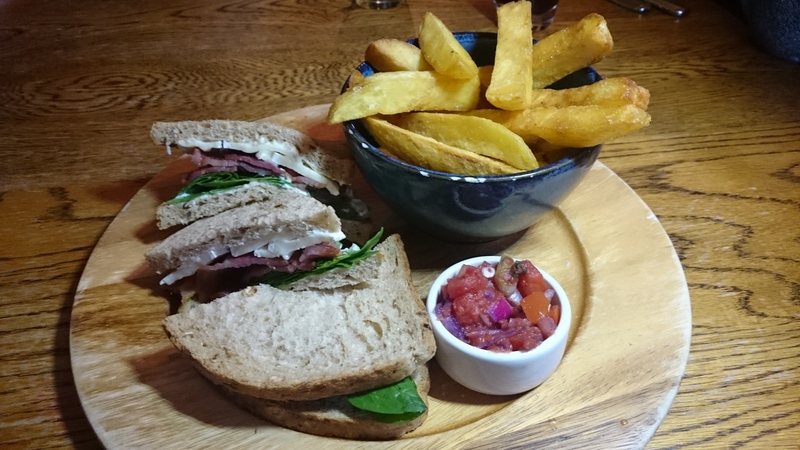 Jman went for the Crispy bacon, brie, fresh tomato salsa & spinach on granary with home cut chips £7.50. The chips were lovely, the salsa fresh and the sandwich very good. Probably more than good, he’s raved about this pub ever since. He also appreciated the notable selection of ales and he definitely wants to return here. 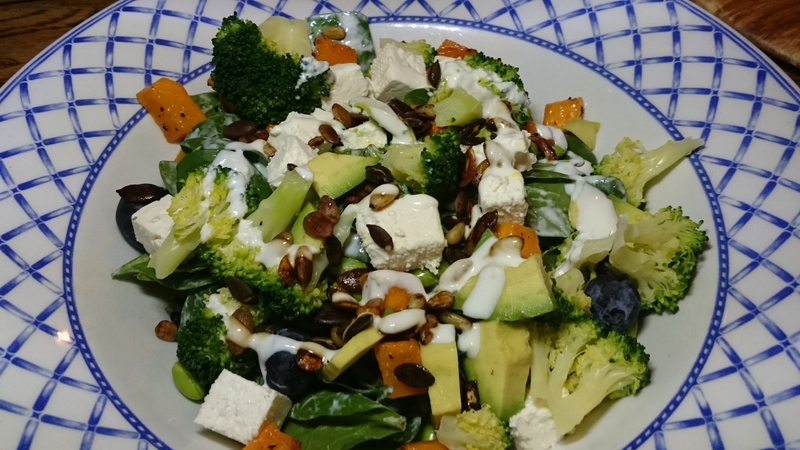 After an indulgent holiday season, I opted for Feta cheese, soya beans, butternut squash, broccoli, avocado, spinach & blueberry salad with garlic, lemon & yoghurt dressing, soy toasted seeds & nuts £9.95. I felt healthy just eating it, finally a day in getting all my five. Filled with many different ingredients, it was nice and varied though a shaper dressing wouldn’t have gone amiss but overall I enjoyed it. I don’t think you can go wrong with the Three Horseshoes in Lalelam. 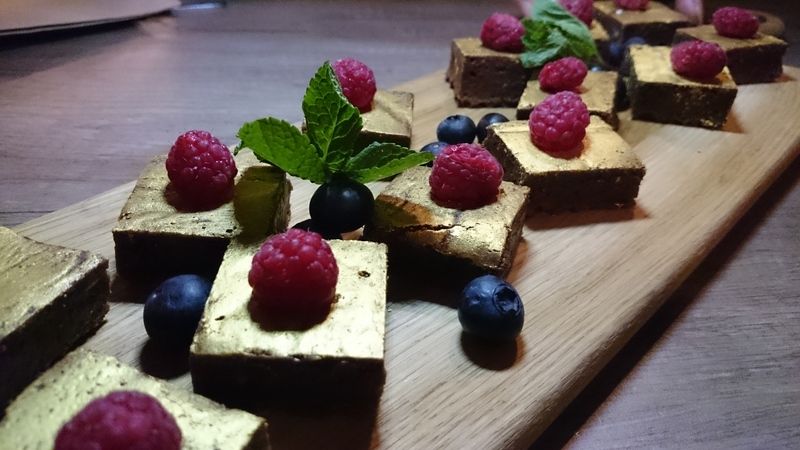 It offers superb food in a wonderful atmosphere, and would be suitable for both a casual lunch and a stylish dinner with friends. As you may know, whenever I have a visitor from Canada I always seek out an extra impressive Surrey pub to take them to. 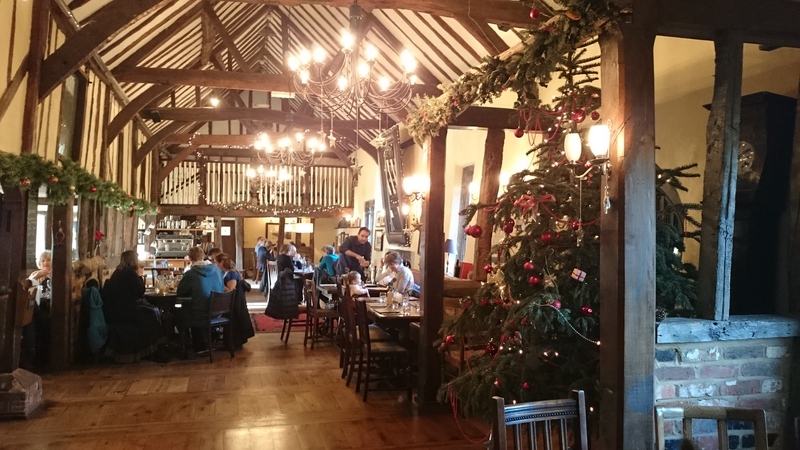 On a hot tip, this time we headed to The Refectory in Godalming for an impressive lunch in a massive converted half-timbered cattle barn. Inside is simply stunning. Wood beams criss cross everywhere, there’s baby windows and balconies and either end of the building. This pub has the definite wow factor. A bar sits in the middle, flanked on either side by the bar area and the restaurant area. There’s not too much difference between the two areas, one offers table service and the other allows dogs. It’s a Brunning and Price pub. Brunning and Price have several pubs in Surrey, including my very first post, The Mute Swan in Hampton Court. They do a great job at making each of their locations seem like an individual pub. There’s an atmospheric patio area outside. We brought our doggie so sat in the bar area and didn’t have table service. However, all the staff we spoke with were very friendly and helpful. The menu is broken into small sections that cater to a whole host of wants. Much of the menu changes seasonally. 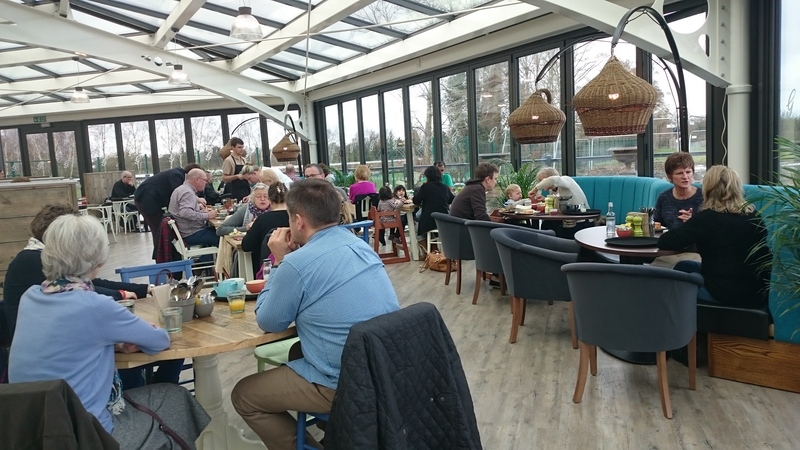 The Refectory’s menu has many interesting options, from pigeon breast to Sicilian fish stew (as well as some old favourites). We had a hard time choosing just one dish. Except daughter two, who can always be counted on to order Pea and ham soup with cheese toasty £6.25. 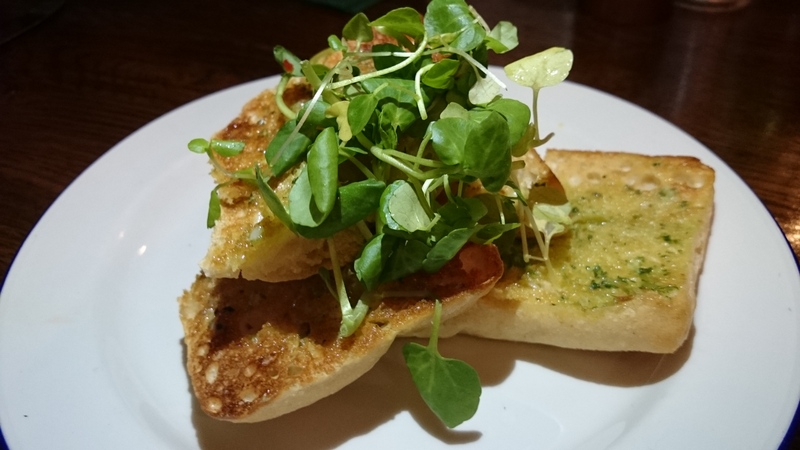 She also had an order of Garlic ciabatta £3.50 She enjoyed both of her dishes. 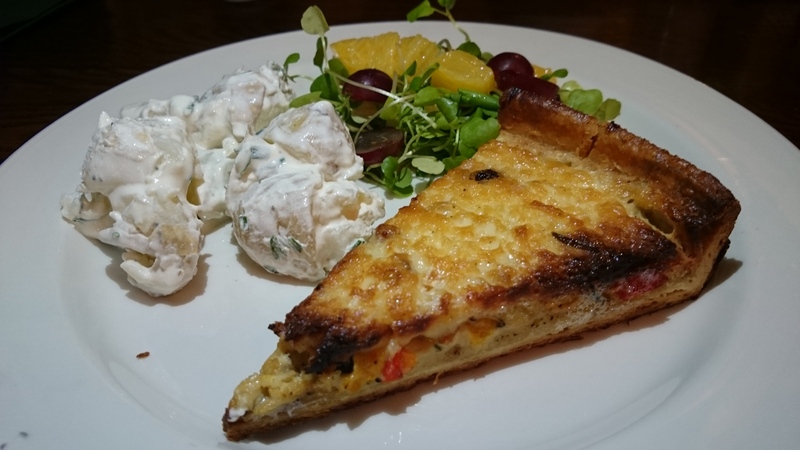 The Canadian guest, my father-in-law, chose the Broccoli and blackstick blue cheese quiche with potato salad £8.95. The quiche was very tasty, he really rated it, and the potato salad was also very nice. 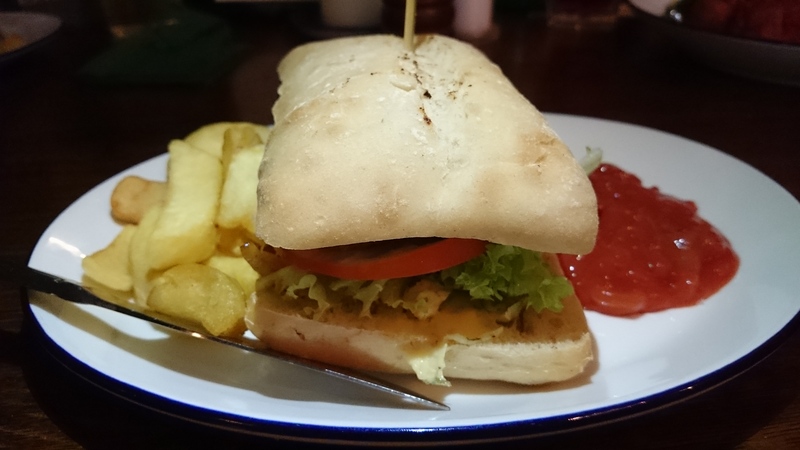 Jman had the Rump steak sandwich with fried onions, tomato chutney and a few chips £9.95. He reports it was good overall, the steak may have been a bit chewy but not too bad. 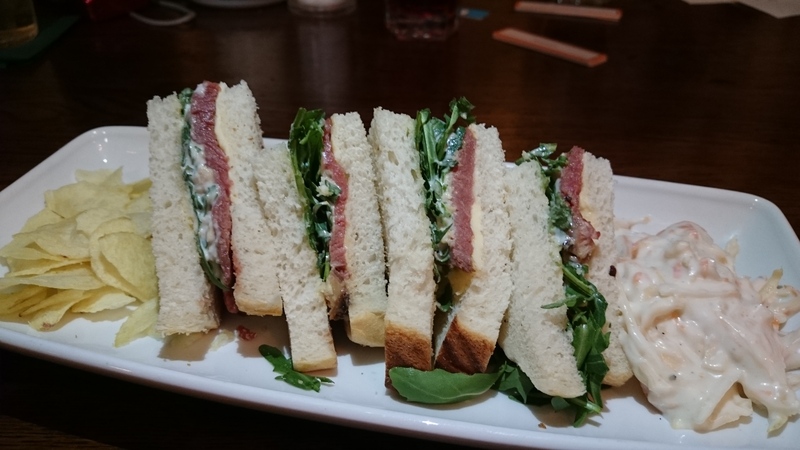 Daughter one had the Rare roast beef with rocket and horseradish on white bread £6.75. She reports it was very, very, very good. 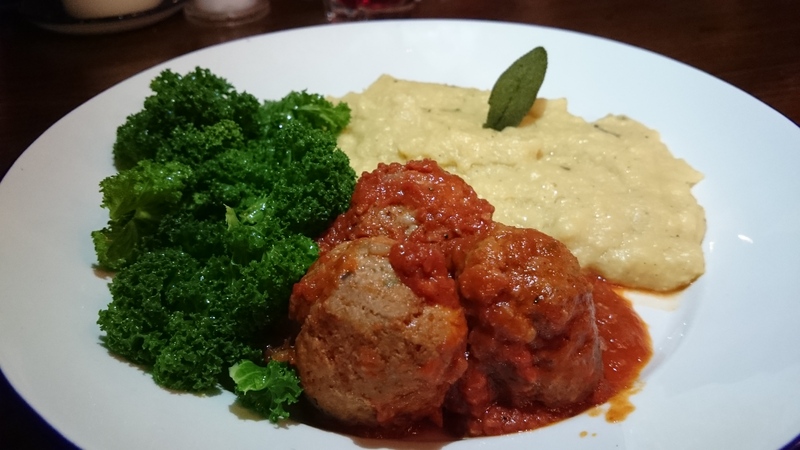 My interest piqued, I settled on the Wild boar and chorizo meatballs in slow cooked tomato and basil sauce with creamy sage polenta £9.95. I loved it though I had to concentrate to notice the chorizo. The tomato sauce was super yummy and even the polenta was moreish. Each of my children ordered a dessert, that way I can eat some and keep my conscience clear. 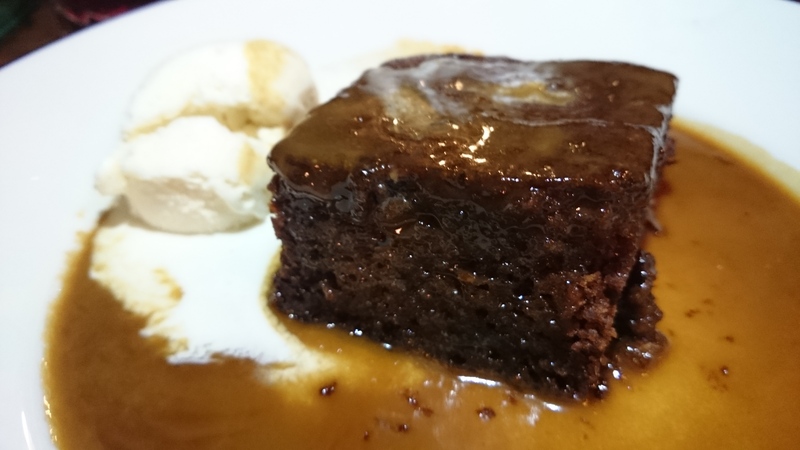 Number two ordered my favourite, Sticky toffee pudding with apricot sauce and clotted cream £5.75. She suffered because I ate half of it, as it was so delicious. She needs to learn from her sister and order something I’m not so keen on. 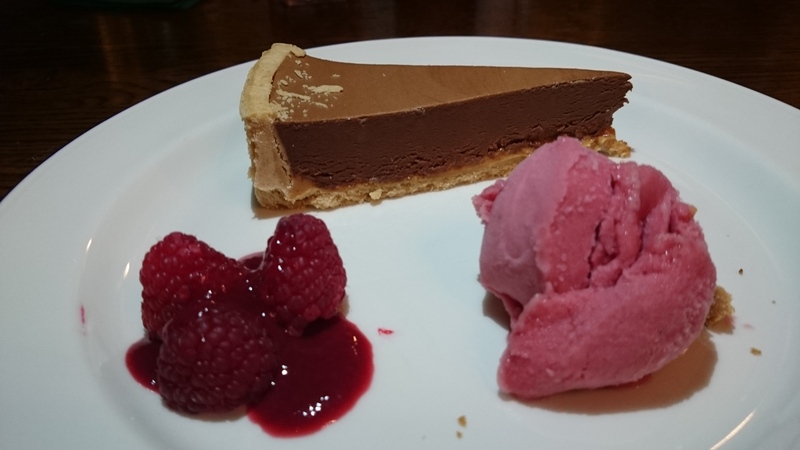 Number one selected the Chocolate and salted caramel tart with raspberry sorbet £6.50. I only had one bite of this, it’s not my thing but she loved it and ate every last morsel. We loved The Refectory. It was good food in incredible surroundings. We’ll definitely bring the next set of Canadian houseguests to it. I haven’t dont a post in a while. My camera broke and I was unsatisfied with the substitute I had. 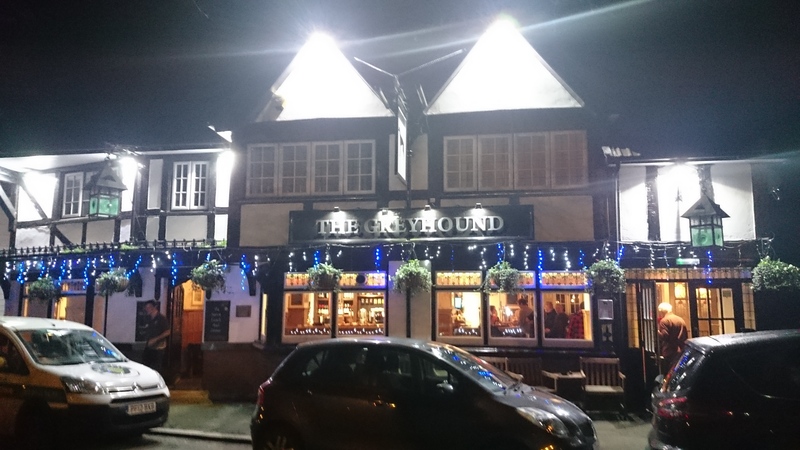 Finally I have my camera back and was eager to use it so the four of us plus one Canadian visitor headed out to The Greyhound pub in Thames Ditton. An enthusiastic couple bought the pub two years ago. They removed the grim and uncovered some lovely original features – open fires, light wood panelling and a pretty set of doors. 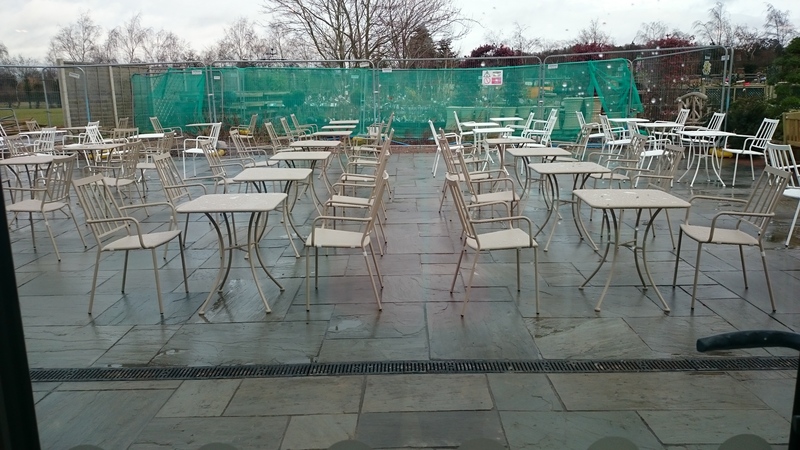 They’ve completely revamped the garden, turning it into a large al fresco seating area. The inside is a bit of a reverse Tardis. I would recommend sitting near the bar to capture the ambiance, we were towards the back of the pub which was away from the action. Above all I’d recommend sitting in the charming ‘snug’ but this area is only open at peak business or for private groups. Staff are super friendly. Food is prepared fresh onsite and menu options change seasonally. The menu is divided into small and big plates. Small plates are intended as appetisers and big as mains. There’s also a children’s menu, on which all options are £7. 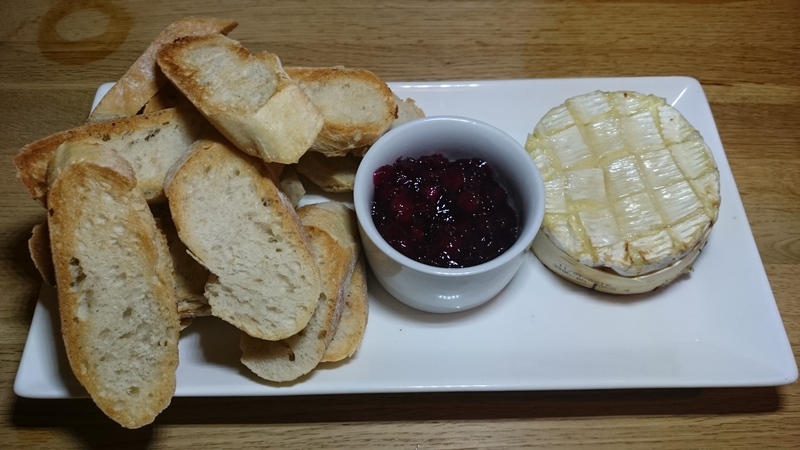 From the small plate section we decided to share Camembert to Share with toasts and cranberry dip £7 as a starter. The pile of bread was enough to give everyone a nice amount. The cranberry dip was lovely. 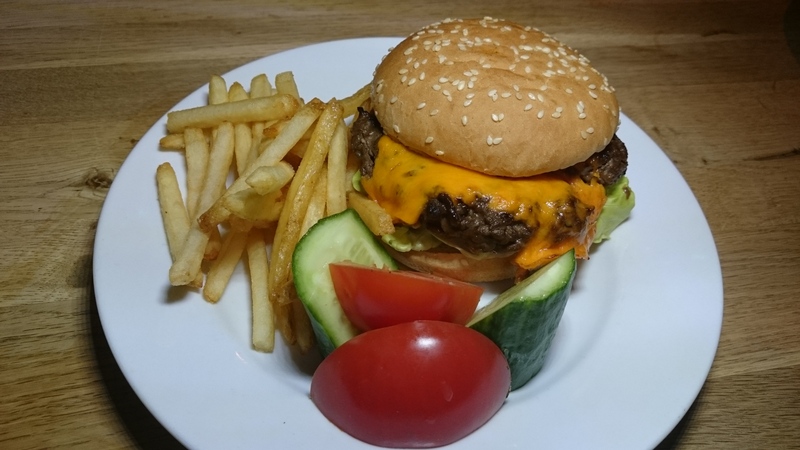 For mains, Daughter two had the Buddy’s Beef Burger: Served in a bun with chips, salad crudites and ketchup £7. She ate it all, which is saying a lot for that child, she never finishes anything. It wasn’t a small portion either, a good sized burger and plenty of food on her plate. 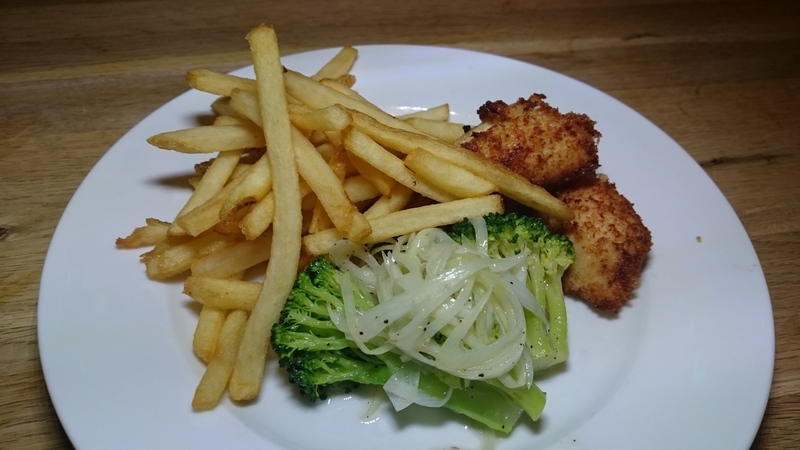 Daughter one had Lana’s Chicken: Breast strips in breadcrumbs with chips and seasonal veg £7. It was good, she probably could have done with another piece of chicken but it was really nice to see a child’s menu item come with vegetables. 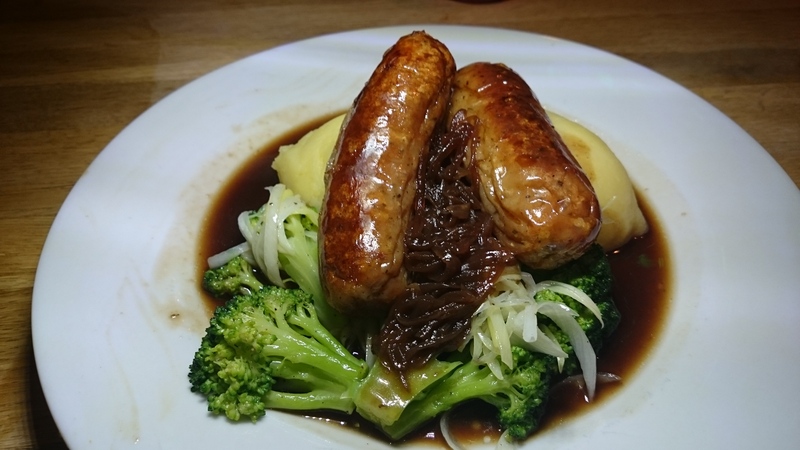 For mains, our Canadian guest had the British Sausages and Mash with onion chutney £11.50. We asked, British sausages are a pork based sausage from the local butcher. It was a good dish, nice and tasty. 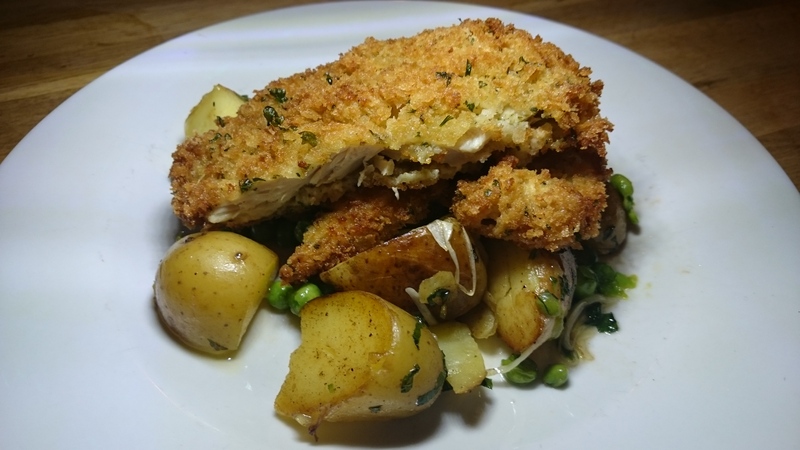 For his main, Jman selected the Crispy Chicken Breast with minted peas and crushed potatoes £12. A fair sized portion, the herb crust was flavourful and the chicken juicy. I naturally wanted everything on the small plates menu and nothing from the large, typical. I decided on one small plate with a side. 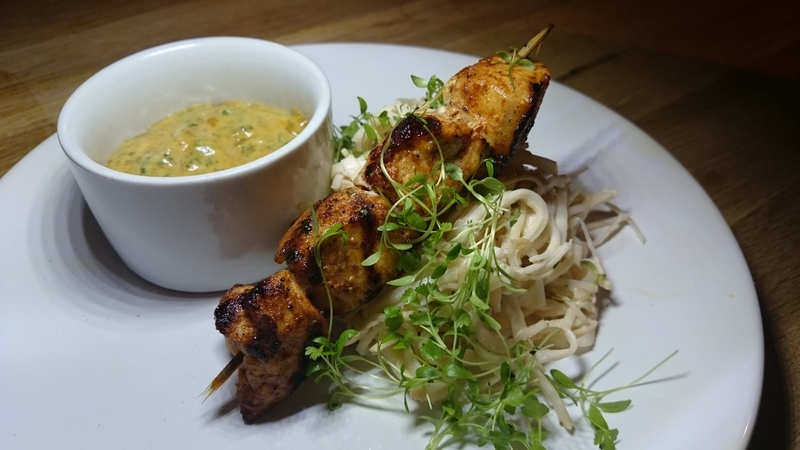 I chose the Chicken skewer, celeriac & apple salad, coronation mayo £6. It was a bit on the small side, for a small but the chicken was perfectly cooked, tender and juicy. The mayo was moreish and the apple coleslaw portion generous. To turn my small plate selection into a meal I ordered a side of Triple Cooked Chips £3. They are Hand cut on site. 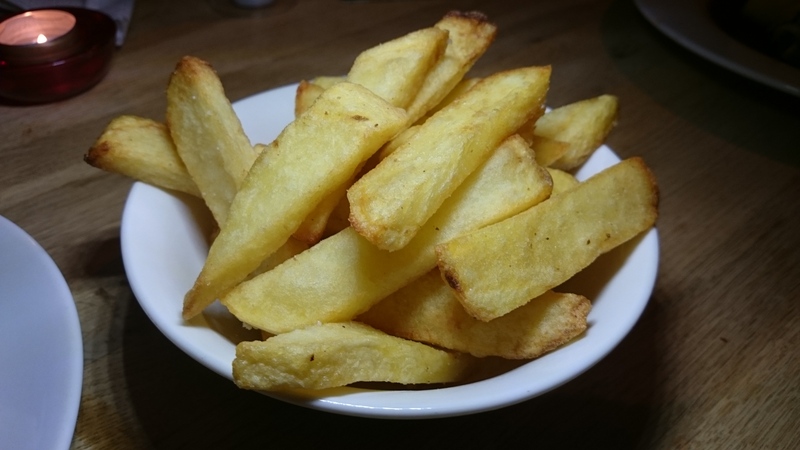 I was dubious when they arrived, triple cooked chips are normally square not rectangular but one bite and I was sold. They were super yummy, more rectangular chips please. It’s wonderful to find a pub run by such enthusiasm independent owners where you’re guaranteed a warm welcome. I wish them best of luck with their venture. Enter your email address to receive notifications of new Ladies Who Lunch in Surrey reviews by email.